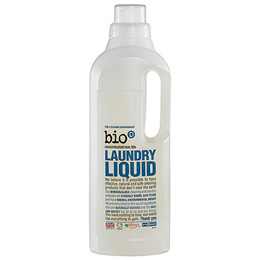 Below are reviews of Bio D Fragrance Free Laundry Liquid - 1 Litre by bodykind customers. If you have tried this product we'd love to hear what you think so please leave a review. Expensive compared with Co-op vegan washing tablets, but really like the fact that it's unscented and it seems to do a good job when used in conjunction with the nappy sanitiser powder. This is our second lot purchased and we'll keep buying it again in the future. Would recommend. Best wash liquid I've used. Suitable for my son with eczema, great on food and grass stains. Works as well as any nasty chemical laden laundry soap that I've ever used. Great stuff! I have been using this for quite a while and it is safe for almost everything including silk which wash in it. No irritation on the skin. Have used others but this is the best. Excellent for sensitive skin and eczema. Washes well, great used neat on grass and food stain, even ketchup. After many years searching for a good wash liquid I won't use anything else. Perfume free unlike another well known eco brand which leaves an odd smell. I'd recommend this to anyone. Great for clothes, skin and environment.